This topic contains 12 replies, has 8 voices, and was last updated by Kari and Lawrence 4 months, 1 week ago. After 27 years Sailing Raga with a hank on Genny. I’m showing my age. If you have experience with Roller Furling System on Nick 38 please respond. Ease of use and low failure rate. I have a suggestion of Harken but no type or model #. 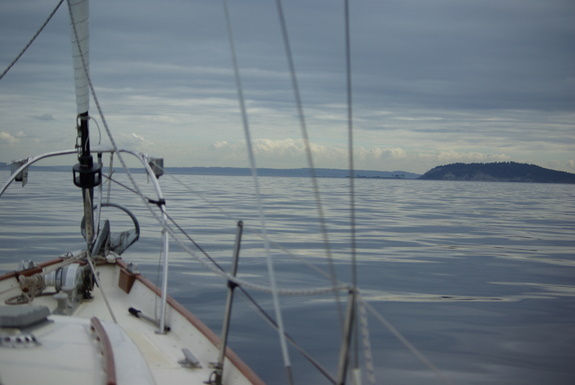 When we purchased Rainshadow, she had hank-on sails still (and the original sails as well). We sailed her for one season with these hank-ons, and Van loved the simplicity of the hank-on approach. However, I frequently sat white-knuckled at the helm while he was hoisting or lowering the head sail in heavy seas, so I was rather insistent that we change to a roller furler (We had one on our previous boat, so I knew of its luxury). 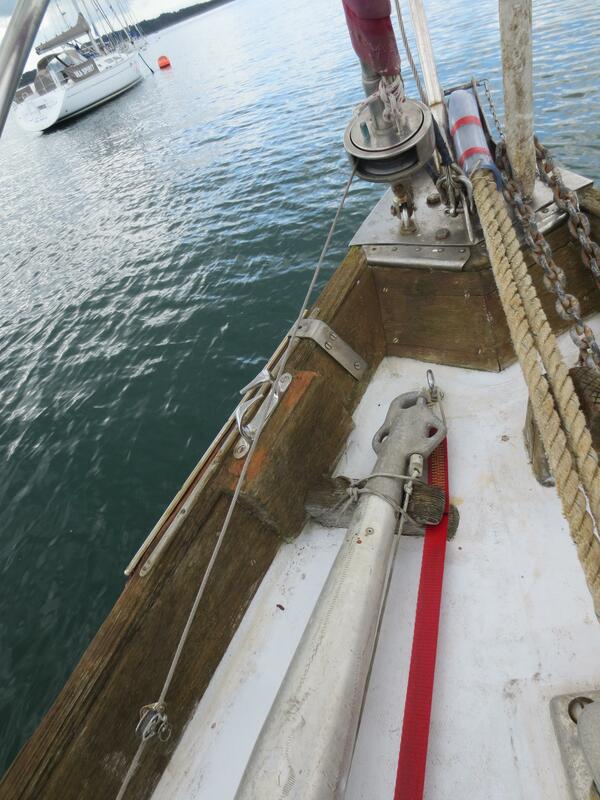 We installed a Harken Mark IV Unit 1 roller furler. It required a haylard restrainer be installed at the top to ensure the correct fair lead to avoid haylard wraps. You can see a photo of this installed restrainer here. This restrainer is a harken part as well. We installed the drum using long link plates in order to keep the drum away from the anchor roller and to get the foot of the sail above the pulpit, as can be seen here. This lost a lot of sail area, but makes it easier to see at the helm. I’m not sure Van (as the deckhand) likes this – I’ll see if I can get him to post later. Performance is good – once we had the sail sized appropriately for the forestay length, we’ve had no problems with haylard wraps. The trick is to keep the correct tension on the halyard – too tight and it does not roll nicely, too loose and it may wrap. It’s handy to be able to furl and unfurl the sail from the cockpit, especially when the seas are scary rough and it’s time to reef. Even Van has admitted that he is glad we installed it. If we could do it over, we would add a solent stay and buy a big hank-on light air sail (maybe a drifter). We would buy a working jib to put on the furling drum. Then, when the seas are smooth with light air, Van could easily go forward to hank-on the drifter, and as the wind builds, we could switch to the working jib that could be roller furled smaller. As it is, we bought a 130% genoa for the furler that can be reefed to a working jib. That means if we need a smaller headsail, Van is on deck in the worst seas hanking on a storm jib (on the solent stay that we have yet to add, so we’ve not done this in practice yet). Another word of advice, the headsail gets chaffed at the lower end of the foil, even if you have the harken feeder to help guide the sail into the foil track when you are raising it. We just took our 3 -season old sails to a top-quality sailmaker (Port Townsend Sails) for beefing up this sail to make it better for offshore work. There were a lot of modifications required at both the tack and the clew as the original sailmaker (North Sails) did not build it for longevity with a furler. So be concerned not only about the quality of the furler you purchase, but also the quality of the sail that will be used with it. Your topic is very timely since adding a roller furling genoa is my current winter upgrade to Rampant. We have been hanking on the genny all these years as well (42 and counting!). I had a Harken Unit 1 recommended to me also so I am glad to hear that it has been a good choice for you. We are also having a new purpose-built genoa made up (135% was recommended, 6.63 woven polyester). I really appreciate your photos. They will help me with my process. And you description helps me understand what it will be like in practice. While I have used furling headsails on charter boats, it’s quite a mental leap to think of using one on our Nic 38! So would you say the halyard restrainer is mandatory or recommended? I am most curious about your “if we had to do it again” thoughts. I would think a roller furling genny would be able to be reefed enough that it could work as a storm jib and thereby remove the need for the solent stay. We also got quotes on A-sails (loose-luffed). But that is another project and another topic! Our boat came with a club jib which we have never used. Anybody have experience with this little headsail? I would like to mount the drum lower than you have. We do not have as big a anchor roller as you do. Our current genoa tacks about 1′ above deck level and I would like to stay low to increase sail area. Chesapeake winds are usually light and we haven’t been offshore in a while. Your thoughts? Anybody else have Nic 38 roller furling experience to share? yes, the halyard restrainer is mandatory. Because of the geometry at the mast head, without the restrainer the angle of the halyard to the swivel at the top of the furler is too small to prevent wrapping. The restrainer was easy to install, it’s held on with six fasteners (I used machine screws which required tapping holes, but a local rigger told me I should have just used monel rivets which are faster and simpler). We used the long link plates to get the sail foot over the pulpit rails, and get the drum out of the way of the ground tackle. We almost always anchor (avoiding marinas) and that’s an area where you don’t want to be cramped for space. I sometimes wish I’d had slightly shorter link plates to get a little more sail area, but really, it’s not a big deal. Re Marilyn’s point about sail plans, the problem with our 130% genoa is that in order to be useful as a heavy air sail when partially furled, it has to be strong and therefore heavy. This makes it a poor light air sail. OTOH, when reefed to say 80%, it has poor shape. So, it’s not really optimal in either set of conditions. Contrast that with a hanked on light air sail on a solent stay, easy to set and douse and very effective in light airs; pair that with a strong working jib on the furler and you get great light air performance and great heavy air performance. Of course, eventually, even the furled sail will be over powered, and then you’ll be hanking on a storm jib onto the solent stay. Well, that’s the theory and someday I plan to change our plan to that. Thank you for confirming about the restrainer. We will plan to include that. I appreciate your additional comments. What is the weight of your furling headsail? I suspect you do more heavy air / seas that we do. On the Chesapeake we often get winds 25-30 but the seas are not very big. I normally fly the genoa until it consistently gets above 25 kts. After that point I would like to roll it in to 80% (or maybe all the way). I hope my new genny built for roller furling will have better performance at 80%. I haven’t set the working jib in years, but when I go off-shore next I am sure I will be glad to have it. For light air I am planning on adding a loose-luff A-sail. But that is next year’s project! I have 2 forstays on Aquarius & assumed this was std on Nic 38s. One [the LHS] has a furling system, using an enclosed wire [4-5mm] going back down the port hand-side [just inside the rail] to the cockpit & a winch on top of the rear coachroof – right of sliding hatch looking aft. It makes single-handed sailing easier [& I can send photos]. 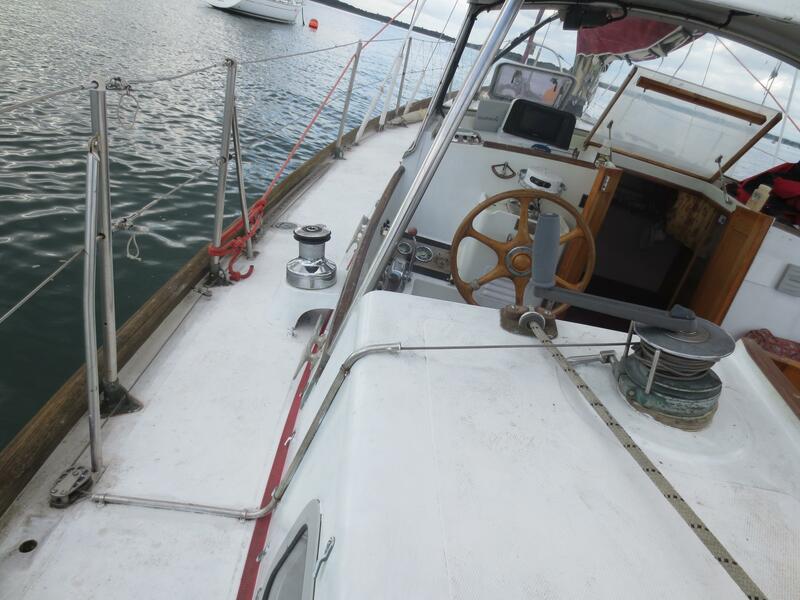 2 pics from Aquarius [#100] furling genny setup. No name on the furling unit, but it works well. Wire furling down port side under the rail, with winch on rear coachroof. [Ideally, the wire should enter via lower section of winch]. In the process of converting the wire to dyneema this winter haulout. We have a Harken mk4, unit 2. I wanted to be sure of the durability after being told the unit 1 might be a bit borderline for a nic 38! We had it installed last October, then cruised the Canaries last Winter, from the UK. Then headed to the Azores in March this year, then returned to the Gower, South Wales in June. Recently returned from Valentia, on the West coast of Ireland, where we had a short fortnights Autumnal cruise, over there and back. The Harken system itself has worked well during all this mileage. However, we have had some problems with the furling line. The supplied line that was installed by the agent, began to get nicked and chaffed. This chafing was quite intense and localised but I could not locate the exact cause, despite contacting the agent. Whilst in Ponta Delgada, Azores I discussed our problem with a local German chap, who ran a yacht repair services company. He somewhat cynically poo pooed my Harken system and informed me I should have bought a Pro Furl, I felt somewhat crest fallen but thought “never mind, what’s done, is done and I’d better make the most of it! Anyway, this old chunkier line worked well until I got out to the West coast of Ireland and into some proper Atlantic swell, although it was by no means rough. I am quite a cautious old tar and like to keep my sweet boat, if anything, then slightly under canvassed. So I had a tuck in the furler whilst going upwind during darkness. The breeze had been easing down from about Beaufort 6 and was at this time about a 4. A fairly dark night was ensuing and she was on starboard tack, when, all of a sudden the genoa completely unfurled. Thanks to my lazy cautiousness no remedial action was necessary. Later, during daylight, I noted the furling line had parted exactly on the turn of where I had installed a new Harken block, at the behest of the agent, on the pulpit before the line entered the Harken furling drum, thereby increasing the angle of turn from the line of the guard wires onto the furler. So I’m guessing this increased angle had been the fault all along. Subsequent from this time, when I’ve wished to shorten headsail. I have gone forward and operated the unit by pulling the line directly from said furler. The difference is amazing, so much less friction and gain of effort without having the line led aft through all those silly little tidying blocks. Now I am not sure i wish to revert to the snugness but unease of furling from the cockpit, clearly more sea trials are needed but unfortunately , I am thinking they must await until next season. On another matter, as the headsail is the main driving force on a nic 38, it would be the last sail I would remove completely as the breeze was rising! When it’s getting rather quite blowy, the critical shape and cut of sails becomes less relevant one feels. So if furling to 80% don’t concern oneself with shape and flying telltales, just that one has sufficient drive to maintain steerage, unless of course, one is still racing, rah rah! Hello everyone, We sometimes have problems with oour furling genoa that blocks…. I saw a comment from Van on the geometry of the head of mast. The issue aboard Rainshadow, which Van and I own, was that the angle that the jib halyard made relative to the swivel was too small. 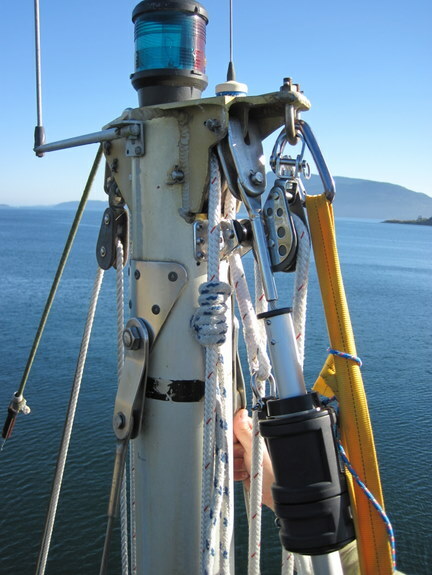 The solution was to install a halyard restrainer near the top of the mast so the halyard approached the swivel at a steeper angle. We have a Harken restrainer one similar to this (not sure the size is the same). There are good discussions about halyard wraps, and how to avoid them, for example this one on Ocean Navigator. One of our many learning experiences aboard Voltair concerned the roller furling of the Genny, using the Harken Mark 1 furling system. First of all, our tendency was to pull the jib halyard up too tight (some of our crew used to sail GP14 dinghies which use the sail luff as a forestay) and then we found we couldn’t furl or unfurl it. Having overcome that problem by slackening the halyard just enough, we got over the first 5 years of ownership without looking too closely at the swivelling mechanism at the top. However, one day, Robin and crew, who were at about 69degrees North, well up into the Arctic Circle, wanted to loose out a bit more sail and immediately had a hailstorm of plastic balls from “upstairs”, most of which ended up in the sea. … and of course the sail fell down and had to be taken off! To cut a long story short, we replaced those damn balls three times while we were in Scandinavia, but gradually we got more cunning, and re-worked the awful Mark 1 swivel into a unique Voltair design that did not have the same reliance on 0.030″ of engagement of circlips into grooves as the designer somehow thought would be adequate. The last time we had a shower of balls was in 2008, when we were heading south to Gothenburg, and were just north of the island of Marstrand. I was skippering, and got on the phone to Robin in England to find out where the Swedish agent for Harken hung out……… by the time he found the answer, we were berthed up for the evening in the town. Where was the sole source of Harken parts in Sweden? “on a small island called Marstrand”, said Robin – neither of us could quite believe our luck! Within an hour Erich Hagen, the MD of the Swedish subsidiary, and his wife were aboard, bringing with them 70 more of the little (but expensive) torlon plastic bearings, and consuming a large GnT. We discussed the problems with the unit, and finalised our ultimate modification to avoid further disasters. I hope you understood the above explanations. If the halyard runs too close to parallel with the forestay, it can then become twisted around the forestay. By mounting a turning block onto the mast below the forestay halyard sheave and close to the furler top swivel, will eliminate this problem.